Boeing's assembly site in Everett, Washington, is the largest building on earth by volume. Large enough, as Boeing often points out, to cover Disneyland. The aircraft maker gave CNNMoney rare access to the factory floor where a portfolio of wide-body planes, from the 747 "Jumbo Jet" to the 787 Dreamliner, take shape. The factory is stocked with parts flown in from suppliers all over the globe. In one corner, towering fuselages await their wings. In another, four 787s stand end to end, waiting to be fitted with landing gear or wiring before they're rolled to the next station. The sprawling campus that surrounds the factory operates as its own meticulously organized city, complete with a fire station, a medical center, more than a dozen restaurants and a gym. About 36,000 workers keep the assembly site humming around the clock. Workers this week were finishing up the interior of a newly constructed 747 that will be used to carry cargo for UPS. It's the 1,550th 747 assembled at the plant, and they're put together largely by hand, much as they were 50 years ago. Inside Boeing's massive assembly site north of Seattle. The facility is large enough to cover Disneyland. 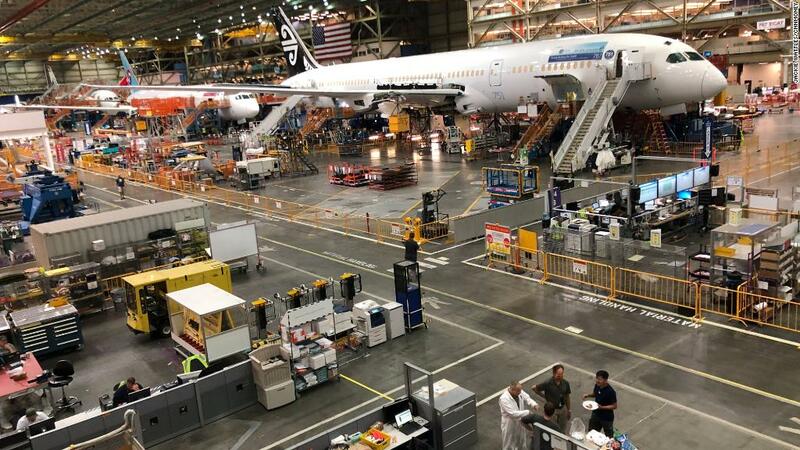 "This is about 6 million parts all coming together," Mike Murray of Boeing's visitor relations told CNN's Richard Quest. "It's an aircraft that's truly hand-built properly." The 747 gained fame as a spacious passenger jet. But these days it's only in demand as a freight carrier. Airlines now prefer smaller, cheaper aircraft with better fuel efficiency. The 787 Dreamliner assembly line, on the opposite end of Boeing's Everett factory, stands as testament. The 787 revolutionized how Boeing made planes. It uses lightweight composite materials and an electrical system that increases engine efficiency. But mastering construction took time and caused significant growing pains for the company. The first commercial flight of a 787 in 2011 came years behind schedule. Production of Dreamliners runs smoothly now. Boeing assembles them in Everett and at a second plant in South Carolina. 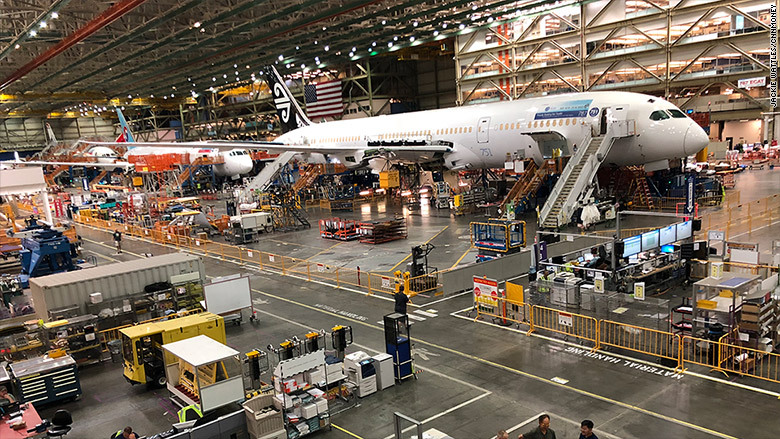 At the Everett plant this week, planes being built for airlines including Korean Air and Air New Zealand are lined up for finishing touches, preparing to join the dozens of other 787s flying today. But Boeing says it's not done tinkering with the production process. "We're still coming up with new ways," Murray said. "Our teams meet every week to discuss what they can do better on the aircraft." Boeing hopes one day to have Dreamliners rolling off an assembly line that constantly moves, similar to an automobile plant. It's also how the 777X, Boeing's forthcoming passenger plane, will be built. A sprawling section of the Everett plant is dedicated to the 777X and Boeing's most high-tech manufacturing effort yet. The first planes are being assembled on a production line that moves at about an inch and a half every minute, according to Murray. "A moving line helps to drive even more efficiency," he said. "You can start to identify more waste in the production system." Boeing is hoping it can respond quickly to any potential kinks in the manufacturing process and avoid significant delays in the rollout of the 777X, for which Boeing already has more than 300 orders. The first delivery is currently expected to take place in 2020. "We're always pushing to build tomorrow's airplane today," Murray said. "It's coming together very well."